What was so great about Gatsby? The way I choose the books I read is sometimes serendipitous—a swirl of little coincidental events that will nudge at my brain until I finally clue in to the fact that Universe is trying to tell me something. For example, when a discussion with a friend about favorite movies led around to The Great Gatsby, I hardly thought anything of it, except to comment “I’ll never forget that billboard with the eyes”. Then, a few days later, I discovered that Hunter S. Thompson of all people was obsessed with The Great Gatsby—that he would rewrite it over and over so he could “teach my neurological system how it felt to write that kind of prose.” That did it. I heard what the Universe was trying to tell me. Suddenly I had to see how a story written about a few idle, rich, and decadent young men and women could evoke such strong feelings in both veiled Iranian women and America’s leading prophet of the psychedelic experience. I had only the vaguest recollections of the book from high school, just a fuzzy impression of swanky high-toned parties presided over by Robert Redford. I remembered that I had thought Daisy, the girl, wasn’t worth all the bother. Boy was I wrong. For those of you who, like me, can barely remember the story, The Great Gatsby is about a mysterious young man with a dark past, who loves a woman married to somebody else. Tragedy is inevitable. 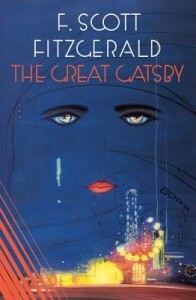 Reading The Great Gatsby was like listening to Mozart. It was elegant, dazzling, and intense. To say it is a story of lost love is as deceptive as calling the Mona Lisa a painting of a girl. Only poetry, I thought, is so devastatingly precise. It is, also, a truly beautiful story, a story about a man reaching out for a dream, only to see it slip like smoke through his fingers. Gatsby is often called “the great American novel” but there is something universally familiar in the scene where we see him staring off across the water at the far away green light that he knows belongs to Daisy’s dock. I found myself almost angry that I had waited twenty years to re read it. I also think maybe I needed that twenty years to appreciate it. Most kids read Gatsby in high school, when their dreams are still ahead and the future is still bright. Perhaps it is only when we are standing amidst the wreckage of our failed dreams that we can see the beauty in Gatsby’s story. “Don’t go chasing after the grand theme, the idea,” the teacher told her angry Iranian students, “as if it is separate from the story itself”. Perhaps that is how we know that F. Scott Fitzgerald wrote a truly great book. It can inspire and incite readers all across the planet, but it can’t be dissected without being destroyed, anymore than an egg is still an egg after you break it to see what is inside. All I know, is that after I finished, I reread it again. And again. And it is the only book I have ever read, in a long, long history of reading, that I have ever wanted to call “perfect”.